The Formula 1 party may soon be over for Pastor Maldonado as political changes in his home country may well dry up the substantial financial support that has underwritten much of his career so far. Until now, the 29-year-old Venezuelan's Formula 1 career has been powered by state millions, through the oil company PDVSA and the personal backing of president Hugo Chavez. Chavez, however, died last year, preceding a period of intense political turmoil, and at the same time PDVSA's ploughing of state millions into Williams and later Lotus was already highly controversial within Venezuela. Now, Venezuela has a new sports minister, Antonio Alvarez, who has indicated this week that motor racing is being totally cut from the country's list of priorities. 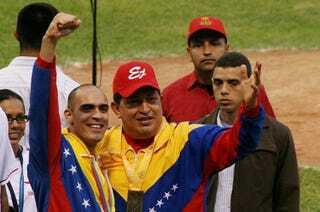 "I know I'm going to win a lot of enemies," he is quoted by Venezuela's Ultimas Noticias.